Erythritol is a sweetener that occurs naturally in certain fruits, vegetables, and fermented foods. It is used to make measuring easier and acts as a flowing agent so the concentrated stevia and monk fruit extracts can be put into packets. Monk Fruit, also called Luo Han Guo, is a sweet fruit that has been used as a food, beverage, and traditional medicine for centuries in Asia. Stevia is an herb native to South America. For over 1,500 years, people have used fresh and dried stevia leaves to sweeten food, beverages, and herbal medicines. NuNaturals is a family owned and operated company that has been providing delicious, healthy products for almost 30 years. We started in Eugene, Oregon with a mission of “Helping to Keep You Well” and believe that the path to wellness starts with the foods and beverages we consume. 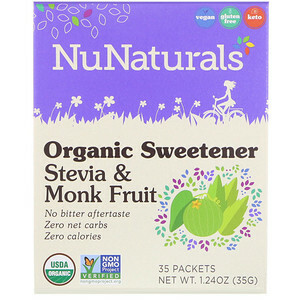 Organic erythritol, organic stevia extract, and organic monk fruit extract. Not a significant source of satured fat, trans fat, cholesterol, dietary fiber, total sugars, added sugars, vitamin D, calcium, iron, and potassium. Net carbs are calculated as total carbohydrates minus fiber and sugar alcohol.